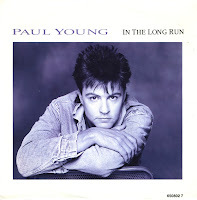 'In the long run' was released as the third single from Paul Young's 1986 album 'Between two fires' - but only in the Netherlands. In the UK, the B-side of this single, 'Why does a man have to be strong' was chosen as the A-side. This single did not chart and can be considered a turning point in Paul Young's career. Up until then, every single he released was a chart hit all over Europe and in the UK. From this moment on, his career would have highs as well as lows.